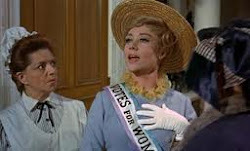 Mrs. Banks goes to Convention: Convention Hotel bookings now open for Marriott World Center! 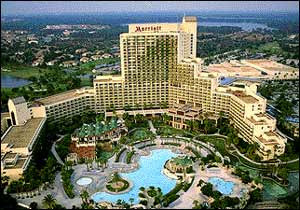 Convention Hotel bookings now open for Marriott World Center! Zonta International have announced that accommodation and dining reservations at the Marriott World Center are now open for Convention 2014! Convention organisers are offering an online registration process to book your accommodation, and your dining reservations too. This selection is key as, from that point on, the system appears to only offer you that type of room, no matter what variables you enter. Say you enrolled as a single person wanting a king bed. You can go on to ask for multiple rooms and ask to sleep 5+ people but it will still only offer the original single person, king bed room type. I look forward to someone a bit more savvy than I telling me how to work though that system. I recommend you work out your accommodation arrangements (single?, sharing?, bringing the kids?) and then start the process. I do recommend staying at the Marriott for the convention period - predominately for the convenience. There is not much else around except the Nickelodeon kiddie themed resort across the road expressway. Doesn't even look like a pineapple under the sea! Taken from Lv 28 of the Tower. Take care dodging the traffic! Staying anywhere else will require a 10 - 15 min drive and you would have to park in their multi-story and catch their little shuttle - oh hang it - too much work already! Esp. if I want to stay up chatting with you until 3am! Due to the heat and school holidays, I also recommend that you do any holidaying BEFORE convention, and finish your trip with convention. Stay where you want to be holidaying (e.g. Hmmm .... a Disney resort??) and then move over to the Marriott. The Marriott are offering the special convention rate for a week or so before and after the convention - and then the opposite will apply re: travel. You will need a hire car and you will have a 15 min drive every time you want to go somewhere. Pool view rooms - one of two pools. 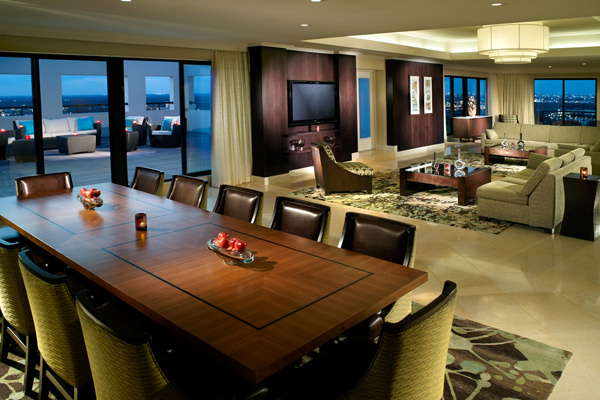 The Marriott has 2009 rooms, including 110 suites in 8 configurations. Jane Adams, ZI International Convention Chair, has confirmed that the Zonta rooms available through convention bookings are these Standard rooms. Price variance depends on the number of people in the room. The most common room is the Standard - either 1 king bed plus pull out sofa bed; or 2 double beds. Conference flyers have previously revealed that the contract rate for this room is USD $169 plus tax 12.5% = approx. $190/night. At 425sqft this is a pretty comfortable size! The flyer shows a "double room" at $189 (+tax = approx. $212) and a "quad room" as $209 (+ tax = approx $235). Book NOW Aussies - whilst our dollar is above parity! The Marriott charges different rates for different views ('pool' or 'resort' - aka front driveway, carpark, or convention centre roof) higher or lower floors, connecting rooms, and of course, if you are in one of their suites. I am assuming that they will also charge extra if you use the sofa bed. Right now, I am not sure exactly what is offered for conference rooms. I am guessing it will be a lower floor, "resort" view. For nicer views, go higher than the 7th floor, and preferably "pool" view. Some rooms have a clear view of the Epcot fireworks (probably Tower and West wing pool view). Hopefully soon, all variables will be revealed by the Convention Organising Team and let the planning begin! Here is an example of one type of suite - the Promenade. There are 10 of these and they offer 2 beds and a separated seating area with a sofa bed. Plus with 477 sqft you score some extra space. Described as having a wall panel separating the sleeping area from the sofa bed, this is useful if someone snores! The strange side? They are described as a "non-view" room - whatever that means. Suites just get larger and more complicated from there: they start adding dining suites and kitchenettes; and making the bedroom a separate room from the living space. Although I note there are few rooms with multiple bedrooms - they appear to use interconnecting rooms to achieve that effect. 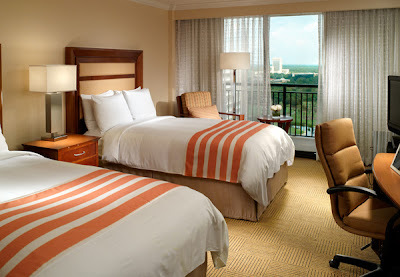 Go and have a look at the range of accommodations available at the Marriott World Center. That page has all the info, photos and floor layouts, for both the standard guest rooms and the suites. My choice? Who wants to share the International Suite with me? I can so imagine myself on that rooftop terrace, with my Kungaloosh! Time to start planning. Get your friends together, get online, and get organised!